We have arrived at a tentative agreement with the administration on our contract, everything except parking. The Massachusetts Teachers Association, our parent union, has advised us to ratify the contract this month to ensure funding from the state. 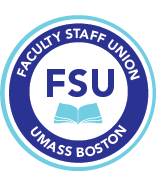 There will be an informational meeting to discuss the proposed 17-20 contract this Tuesday 7/10/18, 10-11:30, Healey Library, LL, Room 3505 (Presentation Room 3; members can participate remotely via Zoom; we will provide call info as soon as possible). Members of the FSU bargaining team will be on hand to answer your questions about the proposed contract. In preparation for the meeting, we are sending you 3 documents. Please bear in mind that these documents will receive one more reading over the weekend to ensure that the language is fully as agreed. We do not anticipate any significant changes, but we will inform you if any changes are discovered this weekend. 1.A summary of the contract (slightly modified from the one we sent last week with a correction regarding CAPS courses to indicate that courses offered after 3PM on Friday will be CAPS courses; previously it indicated after 3PM on any day). 2.The proposed 17-20 contract with full language. 3.A document comparing the new contract language with the language from the 14-17 contract so you can examine the specific differences. Please note that in the compare document, the 14-17 MOU on University College (i.e. CAPS) has been deleted and replaced with the new Article 36. The salary provision for the first year of this Agreement is included as an Memorandum of Agreement in the back of the contract. While the parties have agree to a one year agreement (last year) and a two year agreement for 2018-2020 strictly for the purpose of seeking legislative funding, the result is the same in that we are entering into a 3 year agreement. Should it be more expedient for the University to seek funding for this Agreement as a 3 year contract we want to assure an understanding that, whether a 1 and 2 year agreement or a 3 year agreement all the changed provision in this contract apply for the entire 3 year period.